Blue light is detrimental to our health and it’s quite sad to see people being exposed to it via everyday technology. One of the major effects of blue light on our health is that it can lead to eyestrain. Research shows that over 70 percent of computer workers suffers from eyestrain due to exposure to blue light emitted from LED display. When you look at a computer screen late at night, it may affect your ability to sleep afterwards. Excessive exposure to blue light can also increase heart rate and body temperature. So it’s advisable to decrease bluelight at night and increase it during the day. To cut the story short, here are the best blue light filter for PC, Mac OSX and Linux to help you relieve digital eyestrain. F.lux is one of the most popular blue light filter that makes your computer screen look like a book. The program was designed to help you relieve eyestrain, wind down, relax and get rid of stress before bed. Once you’ve f.lux setup, you’d be able to choose from a variety of color profiles. F.lux makes your computer’s screen color adapt to the time of the day. 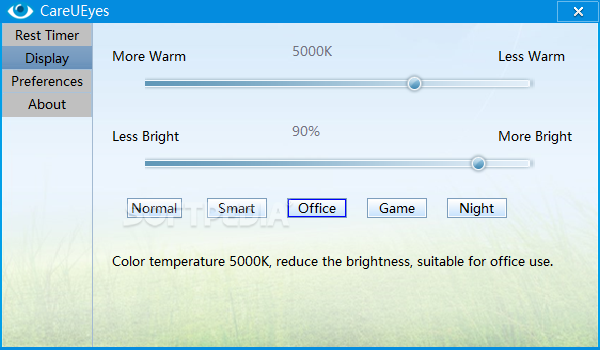 When the sunsets or at night, f.lux will gradually warm up your PC’s screen and restore it to original color at sunlight or during the day. Users can also modify f.lux’s behaviour for specific activities, you can set a mode for watching films or when you’re in a darkroom. RedShift is a blue light reduction program inspired by f.lux. The software came to be after steffesen discovered that xflux (f.lux for Linux) doesn’t feature a sleek GUI and had some bugs. Hence he decided to code his own blue light filter to help adjust the color temperature of a Linux’s screen based upon the time of the day. RedShift’s main goal is to relieve eyestrain when you are working on a computer’s screen at night. 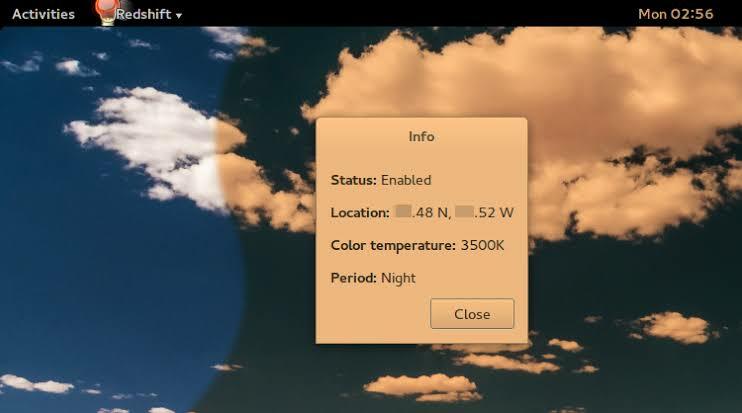 The program changes your monitor’s color temperature according to your surrounding or the position of the sun. During night time, RedShift will adjust the color of your PC’s display to blend with the lamp in your room and at sunset, it’s​ transition smoothly to the default color. Irish is one of the best and most customizable blue light screen filter software specifically concocted to help prevent pain in the eyes, as well as insomnia. If you’re texting late at night and notice that eerie blue glow on your PC’s display, then launch Irish and allow it to optimize and control the brightness of your screen so you will be free from headache. Irish works by regulating blue light day and night. Once you’ve any of the presets configured, the program will automatically and gradually adjust your PC screen depending on the time of the day to enable you sleep better and deeper at night. Iris brings a slew of features and you can set different modes and make your screen more red, orange or yellow. Also Read: The Best Bluelight Filter Apps for Android. 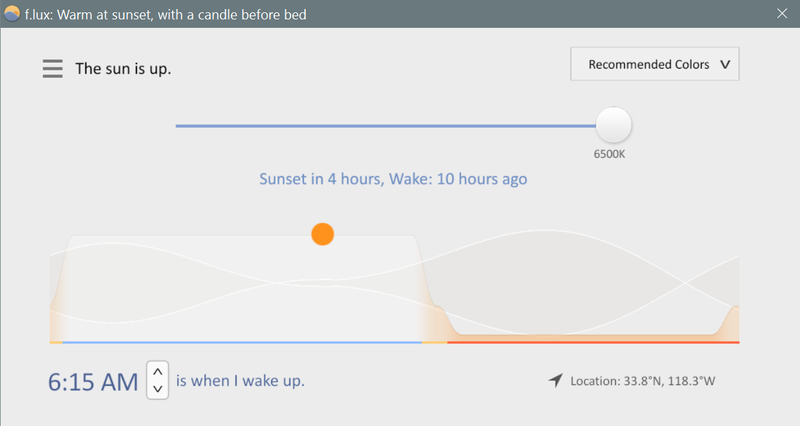 CareUEyes is another outstanding software that automatically filter the blue light on your computer screen to make it look a bit more warmer and even comfortable to the eyes, so you will feel refresh and agile before sleep. Similar to Irish, CareUEyes brings a ton of presets that helps to adjust the color temperature and brightness of your display. One thing I love about this software is that it brings a “break reminder”. When you are working for too long, and just wouldn’t take a break to rest your eyes, then CareUEyes will beep you with a rest notification. The program can dim all screen including LCD, TFT etc. Overall, CareUEyes is a blue light filter that can improve productivity. 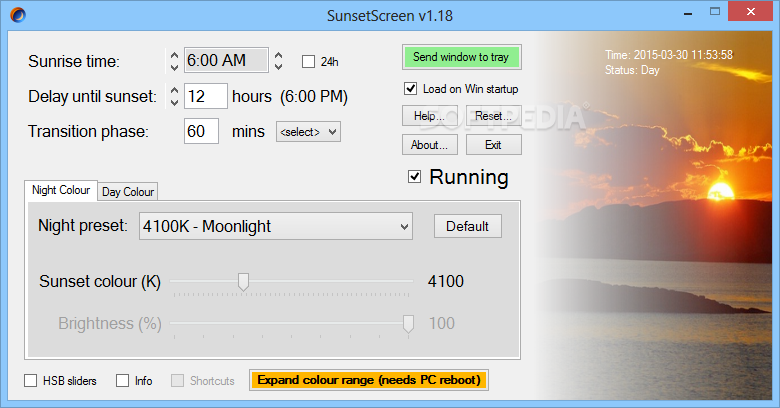 SunsetScreen is among the futuristic blue light filter software that helps to take the glare off your PC’s screen for a healthy and restful sleep. If you feel that f.lux darkens your display too early in the winter, then you should opt-in to use SunsetScreen. The program was invented to dim a laptop’s screen to an orange-ey hue in other to blend or look like the color of indoor lights. With SunsetScreen, you can set the time of sunset and sunrise. If you so wish, you can even dim the overall amount of blue light as well as the brightness for an undisrupted​ and smooth circadian rhythm. SunsetScreen is the best blue light filter for people who are used to doing color sensitive work. If you have ever had to wake up at night to write down that “Next Great Idea” and gets blinded by your computer screen, then you should consider using the above listed blue light filter. Despite the fact that there are a lot of blue light filter software on the web, we where able to fish out the best. In short the above blue light filter are literally what you should be using in other to relieve eyestrain and sleep better at night.